Gone are the days when phones were only used for verbal communication. In this era of smartphones, it becomes a quintessential necessity for not just verbal but all types of communication from web browsing to video conferencing to business transaction and security. Innovation in telecommunication in the last decade has grown exponentially and digital solutions to the most basic of human necessity are achieved by smartphones. In the latest development, digital entrepreneurs have amalgamated three critical personal possessions into one: phone, wallet and keys. The challenge is not just to find a solution for your single key but for the entire keychain. I’m giving you some incredible examples of keyway lock and security through smartphones that fortify your home security as well as personal security. Virtual key system to monitor and control door access through an app. It can also useful for bikes, cars, safes and offices. Smart security automation to control entire house. The new smart key is developed with simplicity in mind. The new smart keys helps you send, receive and delete eKeys. You can also check the log of lock activities and also set notifications. It’s a simple technology where you just once launch the app and relax. No need to enter your password every time. How Does a Smart Lock Work In Real Time? 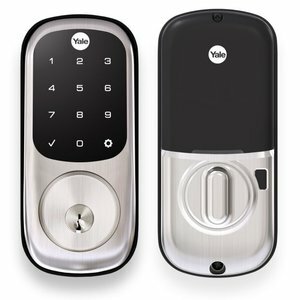 I experimented with the smart lock system and installed Yale Real Living electronic deadbolts founded by famous Linus Yale Jr. and Henry Towne in the 19th century. Other renowned companies in the smart lock and key system are August, Goji and Lockitron. The locks are also a part of home décor and thus offered in various styles. I have installed the second generation electronic deadbolts, which is quite good looking illuminated touchscreen keypads or wireless connections to a smartphone. The styling of these smart locks or digital locks is called keypads, which is installed on the outside of the door. The styling is obviously “handsome” from the outside, and inside it is a large, brick-sized electronic lock with a battery enclosure. There are four battery units inside my door lock that last for a year, which indicates when the power dips low. The deadbolt is programmed with a master code with multiple digital codes. You just need to push your palm to the screen and the door locks. In the same way when you come back to your house, just push your palm to your screen and see the number, type the code and the door unlocks. An electronic door means you don’t have to carry keys with you and open it conveniently when you just step outside your door. However, you need to be careful as the information can be replicable and easy to distribute, so take care of safety of your code.